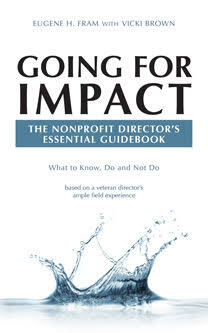 Nonprofit directors often become impatient with the slow pace of progress toward positive change. Here are some actions that may change the situation, improve service to clients and prepare the organization for any long-term mission disruptions. •	Talk With The CEO: He/s may feel the same frustrations and be delighted to find a board member who shares his goals. In fact, she/h may be thinking of leaving or be wedded to the current area only because of a family situation. As a result, your conversation may give chief executive new hope and energy. On the other hand, if the CEO is too aligned with the past, it will be unlikely that the board will terminate the current CEO, unless there are some performance malfeasances involved. * Then, estimate the CEO’s remaining tenure and use remaining time to find opportunities to make modest increments in change. •	Talk With Other Directors: Between board meetings, have informal coffee sessions with other directors to determine their views on the areas in which you feel change is necessary. Three or four board opinion leaders can garner positive movement, assuming there are no strong objections from the CEO. •	Outside Validation. If sufficient budget is available, ask the board to engage a consultant to examine the potentials for change. The rationale for the request might be: “We are doing well, let’s determine how we can better serve our clients.” If budget isn’t available or the CEO is against the expenditure, try to have the board arrange, for an outside speaker or two who might validate the need for change. This might be a person from the field or a local professor who has some insights aligned with change-focused board members . •	Seek Outside Financing: Personally seek sources for capacity grants that, if awarded, might be developed to further help clients. Ask the board to take leadership in applying for several of these grants. A single successful grant might be the linchpin to promote the type of change desired by the group having similar views. •	Chair The Nominations Committee: As chair, the director can be in a position to search for candidates who are forward looking. In addition, the committee, under the urging of the chair, can seek candidates who have served on other nonprofit boards and who have proven their meddle to bring about change.